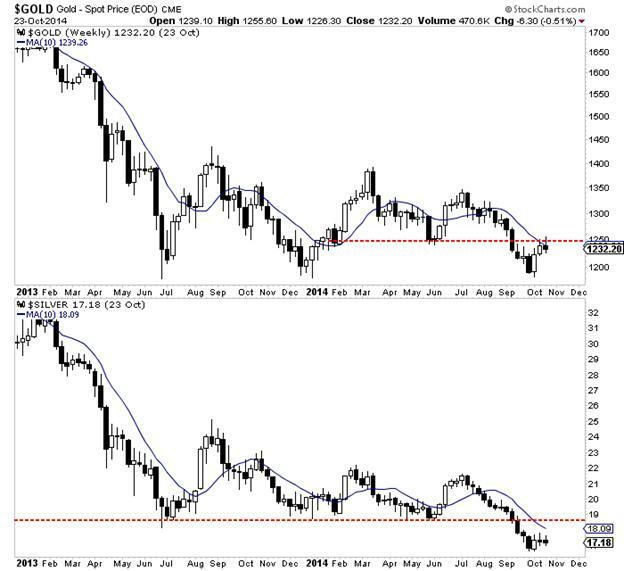 The weekly candle chart below plots Gold and Silver. We can see how Gold has rallied for a few weeks following its weekly close below $1200. Yet over the past two weeks Gold has tested $1250 and failed to close above it. This week Gold will close near the low of the week and below its 50-day or 10-week moving average. Gold is sitting less than 3% above important weekly support and remains below key short-term moving averages. Meanwhile, Silver has not touched $18 yet, let alone rallied back to previous support. While Gold gained as much as $70/oz, the miners couldn’t sustain any gains. The weekly candle chart below is our top 40 index. It contains various gold and silver stocks and the median capitalization is $520 Million. The index has consistently outperformed GDXJ over the past two years. At present the index is barely holding onto important support. It rebounded for two weeks but closed nowhere near the highs of the week. It reached as high 343 this week but was sitting at 316 heading into Friday. 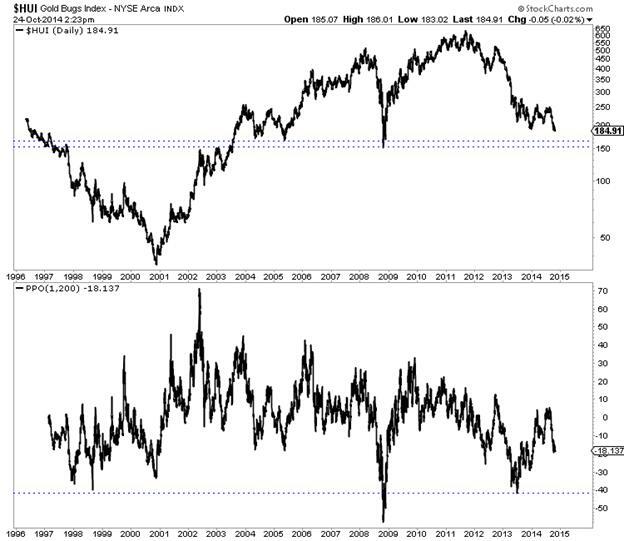 If Gold breaks then this index is headed for a test of the 2013 lows. It’s a strong bearish warning when the higher quality companies are this weak. Meanwhile, the HUI Gold Bugs index has already broken to new lows. It has declined eight straight weeks and could close at a new low today. In the chart we plot the HUI’s distance from its 200-day exponential moving average. The current reading is 18%. Major oversold readings can surpass 30%. The HUI can become much more oversold before it puts in a final bottom. Its trading at 185 and there isn’t strong support until the 155 to 168 range. 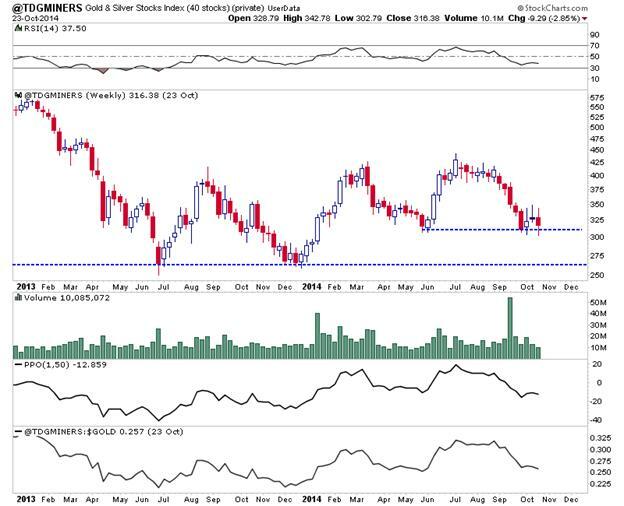 Gold has rallied as much as $70 but the action in Silver and the miners, the speculative components of the sector is very worrisome. It is reminiscent of the autumn of 2008 but to a smaller degree. The mining stocks lead the metal at key turning points and their recent performance continues to warn that the worst may not be over. The sector remains oversold but very vulnerable. The reprieve we wrote about two weeks ago could continue for a few more weeks or it could be ending now. In any event, please protect yourself. While we are at the tail end of a bear market, the miners could decline another 20% before the final low. If the sector declines 20% then certain stocks could decline more. Please stand aside for the time being. I see a potential lifetime buying opportunity emerging in the months ahead. Consider learning more about our premium service including a report on our top 5 stocks to buy at the coming bottom.